In the early 1970 Chile elected socialist Salvador Allende as president. When economic problems followed his policies of nationalization and collectivizing industries, the military ousted Allende in a coup, supported by the CIA. In the midst of the coup Allende was killed. Though the official line was suicide, many suspected murder. Even today, after Allende’s autopsy was released and confirms suicide, many still have doubts. Nevertheless, when Allende was ousted General Augusto Pinochet took over, and essentially suspended all civilian law and law-making bodies. But rather than quickly return power to a civilian government, Pinochet ruled as leader of a military dictatorship. Eventually, though, a new constitution was established, and the country returned to some semblance of democracy. As part of the constitution an election held in 1988 on whether to retain Pinochet as president. 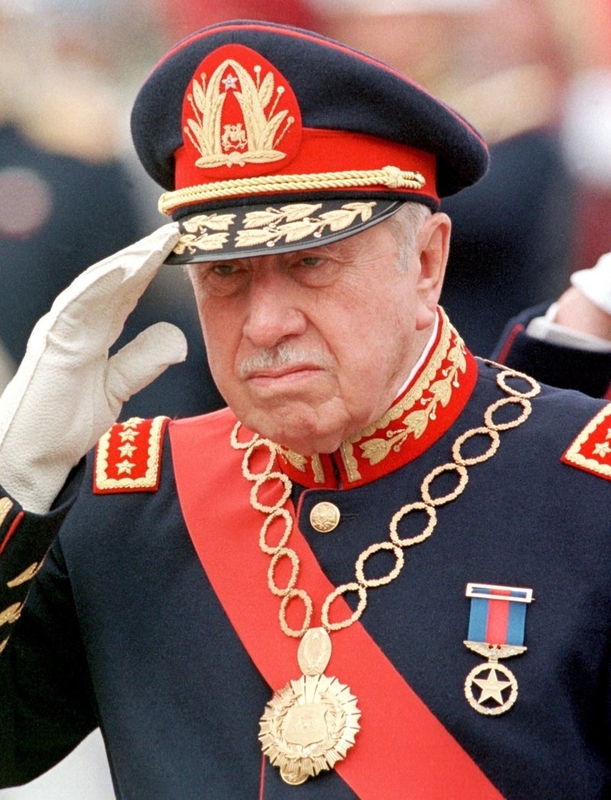 Pinochet lost the election and on March 11, 1990, he left the presidency. In the midst of the Chilean coup, an American journalist (John Shea) uncovers evidence of CIA involvement in plotting the overthrow of the democratically elected president. Shortly thereafter, the journalist is arrested by the Chilean military. In an effort to locate him, the journalist’s cynical wife (Sissy Spacek) and idealist father (Jack Lemmon) begin their own investigation. They get very little help from the US consulate and embassy in Chile, who seem more concerned with protecting America business interests in the region than anything else. Still, little-by-little the truth comes out and eventually they discover that not only is the journalist dead, but his death was likely approved by the CIA. In the end, the cynical wife has her worst thoughts about the government reinforced, while the good company man of a father is disabused of his idealistic notions. Missing was nominated for four Academy Awards: Best Picture, Best Adapted Screenplay, Best Actor and Best Actress. On the whole, both Spacek and Lemmon give creditable performances, and they were your Actress and Actor nominees from the film. Spacek is good, and ably shows the very real fright of living in the midst of the coup, but aside from being a bit beleaguered, and in tension with her father-in-law later on, it’s not exactly the sort of role or performance you’d think would win an Oscar. Which is probably why it didn’t. And even if Spacek were giving the sort of performance to win an Oscar, she’s more a supporting player here than a lead. After all, during the first 15 minutes or so she is entirely tangential, if she’s in the film at all. For the next 1o minutes or so, she’s the only thing of importance. At 25 minutes in Lemmon makes his first appearance and while the two of them divide the next hour between them, Spacek doesn’t really do anything here to say, “Hey, let’s give her an Oscar!” Than, for the last 30 minutes or so, she might as well disappear. On the whole, while she’s good, she’s hardly a lead. One can only hope that some day the Oscars establish a third acting category, The Non-Lead Featured Actor/Actress, for recognizing the performers who are not exactly a lead, but do more than a traditional supporting player. This would be where Heath Ledger in The Dark Knight would be placed, where Benecio Del Toro for Traffic would be placed, and where Louise Fletcher for One Flew Over The Cuckoo’s Nest would be placed. Lemmon’s performance is a bit better, largely because his character has an arc. Where Spacek has to start cynical and remain that way, Lemmon starts out naïve and is slowly educated over the course of the film. He gets several good emotional moments, gets to be pragmatic, and well-plays the transition from a ‘company man’ to ‘cynic’. Still, I’m also not sure Lemmon is he lead of the film, for the same reason I’m not sure Spacek is. If it’s possible for a film to be led by an ensemble, without any having any more time than the other onscreen, and frequently being off-screen, Missing is a fine example of it. While Costa-Gavras shared a Screenplay Oscar with Donald E. Stewart, he was shut out of the Best Director race entirely, replaced by Wolfgang Peterson for Das Boot – the other four nominees for Best Director correspond with the four Best Picture nominees that are not Missing. To me, though, this seems fair. While Missing does have at least a couple very visually impressive moments – particularly the helicopter outside the hotel – it is not a film you’d look at and call well-directed. It’s competently directed, or a bit more than that, and overall the importance of the film is driven more by the underlying story than by the memorable parts of the filmmaking. This is not something you can say about Das Boot. Moreover, the structure or Missing, and the storytelling, is a bit clunky and could be handled far more artfully and with more suspense. As it is, long before we get to the ending, we pretty much assume the journalist is dead and the US government had something to do with it. So, since we know what will be coming, the film has to give us what we expect in a new, or exciting way. Unfortunately, Missing doesn’t, which leads me back to this: while Missing is an important film, that has more to do with the underlying story than the film itself. An interesting aside to Missing is that, despite being in the Criterion Collection, and a Best Picture nominee, the film seems somewhat forgotten today and is not mentioned highly at all in the filmography of any of the three principal participants: Spacek, Lemmon, or Costa-Govras. I suspect some of this is due to the film having the issues I addressed earlier. I suspect another part of it is that this film is a bummer, and literally confirms our worst fears about our own government. Just as important as those, though, is in the midst of it’s initial release, or shortly after, one of the men portrayed in the film – he’s not named, but portrayed – sued it for defamation. This led the studio to pulling the film off the shelf for three years while the litigation wound on. Because the story was already a bummer, making it unavailable for three years effectively limited any chance it had of finding greater appeal on video. And so while the Criterion Collection might recognize it, I’m not surprised it’s basically been forgotten about in terms of the greater culture at large. Best Picture 1982 was Richard Attenborough’s ungodly-long and basically-inert Gandhi, a film that took home the Best Picture prize more for being about a great man, than for being a great piece of filmmaking. Under those circumstances, a flawed Missing at 120 minutes long was better than a boring Gandhi at 191 minutes. That said, other nominees at the 1982 Oscars which are superior to both films include ET: The Extra-Terrestrial, Das Boot, Tootsie, The Verdict, The World According to Garp, and Tron. Being so spoiled for choice, I don’t know if I can pick a favorite. As Missing touches on the early days of the Pinochet regime, it’s fitting to consider a film that covers some of the final days of the same regime, Pablo Larrain’s No. Though Larrain may be best known to American audiences for directing the bio-pic Jackie, starring Natalie Portman, he actually has a pedigree. No was nominated for Best Foreign Language Film at the 2012 Oscars, while his prior films Tony Manero (2008), The Club (2015), and Neruda (2016), were all submitted by Chile for the Best Foreign Language Film Oscar. While Missing is the story placed at the beginning of the Pinochet regime, No is explicitly about the unraveling of the regime through a popular vote. Focusing in on an ad man (Gael Garcia Bernal) running the anti-Pinochet advertising, No is the story of how a political cause – the ending of a dictatorial regime – became just another product to be sold, like Pepsi or Coke. In that way, the film is about what’s happened to politics over the last 30 years around the world, and especially America, in that no longer do we vote for ideas and candidates, but we vote for sound-bytes and quips. We vote for people who look good on TV, in short blips in commercials, not those who know what the hell they’re doing. The interesting thing about the film, and the story underlying it, is that while the regime came to an end based on a popular referendum, up until the very end the threat of violence from the regime was ever-present. In fact, much of the action that occurs in Missing in terms of the harassment and military intimidation is on display in No, as if nothing had changed in the 15 years between the eras in the films. Moreover, you get the sense that at any time the referendum will be cancelled because Pinochet has no use for it. Honestly, that he didn’t cancel it, and didn’t ensure the fix was in, is somewhat baffling. It’s like Pinochet suffered from a most extreme form of hubris and was in denial about his ability to lose, even as he was losing. While the two movies cover various similar goings-on, Missing and No could not be any more stylistically different. Missing brought a relatively big Hollywood machine to the film, and has a certain slickness to it. Even as it tells a rather dispiriting story, you are never really unaware it’s a movie with money behind it. No, on the other hand, because it is shot on digital video in a way that does not hide the digital video qualities, and because it’s shot mostly handheld in the Academy ratio, it is much more visceral and seems more like a documentary than a piece of drama. To be fair, the film is in Spanish with Chilean actors – all except Bernal – so it’s easy to get drawn into the ‘reality’ of it when you don’t recognize anybody in it as a “star”. Either way, of the two films, No is the one that feels visceral, honest, and alive; by comparison, Missing feels like Hollywood stars standing on a soapbox bloviating. She is never more believable in the film that when she begs her husband to leave Chile with her, that day, only to have him promise to leave the next day. Unfortunately, he disappears before that can happen. Or, perhaps, Missing replaced Das Boot in the Best Picture race. Davis v. Costa-Gavras, 619 F. Supp. 1372 (1985). Blade Runner was also nominated for it’s visual effects, but as I don’t like the theatrical version of that movie – I hate the voice-over – I cannot mention it here in any other way. It lost to Michael Haneke’s Amour. Though none received a nomination. Technically the Academy ratio is 1.375:1, though any movie shown in 1.33:1 is usually considered the Academy ratio, probably because they’re so damn close in size they might as well be the same. The DVD for No tells us it was shot 1.40:1.